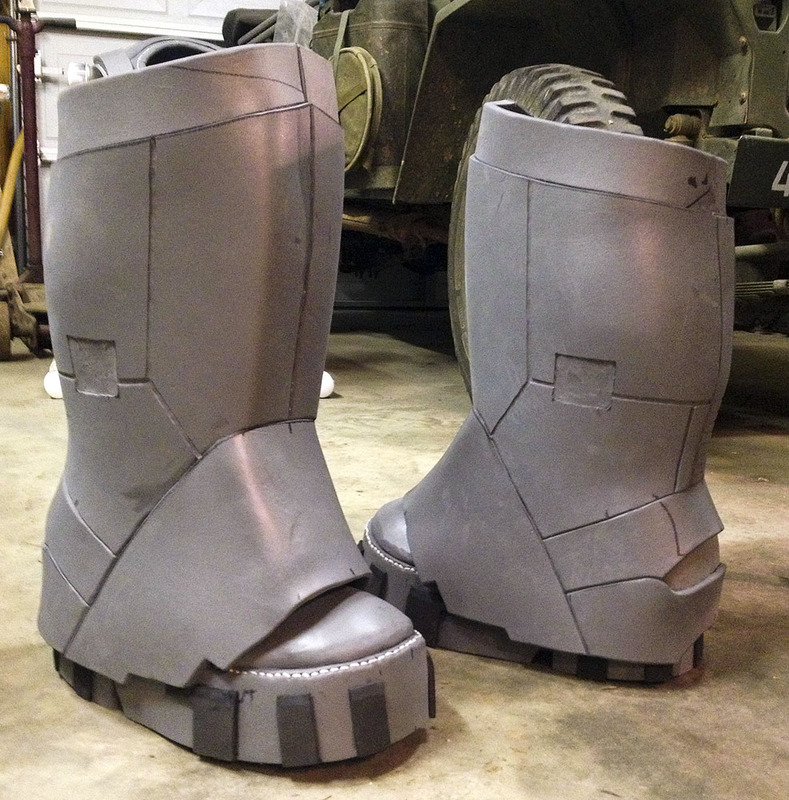 Here are the pieces for the Garron Paduk boots. They have been cut out using an X-acto knife. The sharpie tick marks are to help me match up the pieces and to mark locations for seam lines, center line, etc. The next step for them will be to flatten the texture by heating the surface with a heat gun. After the texture has been removed, you can start to heat the EVA foam for shaping. Keep the heat gun about 2"-3" away from the foam, and keep the gun constantly moving. You don't want to heat it up too much. If you do, you'll end up with a burned/scorched spot. 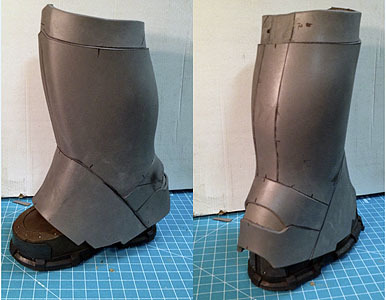 I only use superglue for assembling my EVA armor. I know some people use hot glue & other adhesives, but I've found that my coating/painting aheres better if hot glue is not involved. Bill Doran of Punished Props did a video on his YouTube channel about the various super glues he uses for his props. I couldn't say it any better, so instead of trying, here's his video. You can see that there's a fairly sharp bend in the front of the boot top. This was achieved by grinding out 1/4" deep channel in the back side of the foam. This is the Doc Marten boot with the EVA shell applied. The boot & boot upper will not be glued together. I attached an elastic strap to the pull loop of the boot & velcroed it up high inside the boot top. The elastic was able to stretch when I walked, and pulled the boot top back down when I wasn't walking. Here are the main panel lines cut into the boot top. I used the sharpie tick marks that I made earlier as a guide. Just take your metal ruler & mark the line with a sharpie. Then use the side of a Dremel 85422 Silicon Carbide Grinding Stone to cut the panel line. This is where having the flex shaft attachment is very handy. You can lay the flex shaft along the foam so just the edge of the dremel stone cuts into the face of the foam. 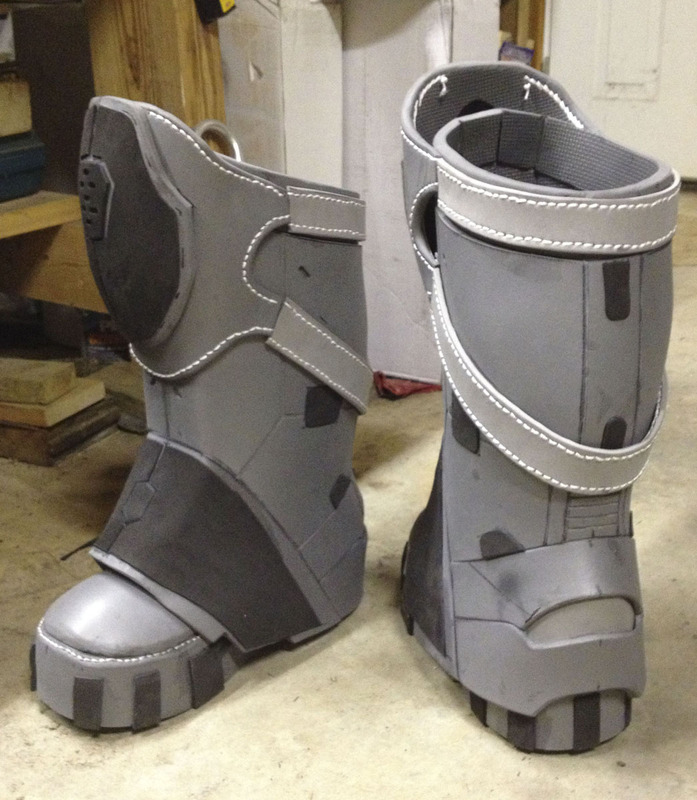 This shows the addition of the kneepads to the boot. As you can see, the kneepad is made from two halves, that are heat formed & then glued together. I could have made this from a single piece, but the model shows a seam there, and making it in two halves allowed me to replicate the shape of the curve accurately for the two kneepads. Otherwise it would have been trial & error to match the curve of the two kneepads. Now I'm applying details made from 2mm & 3mm fun foam (Silly Winks). 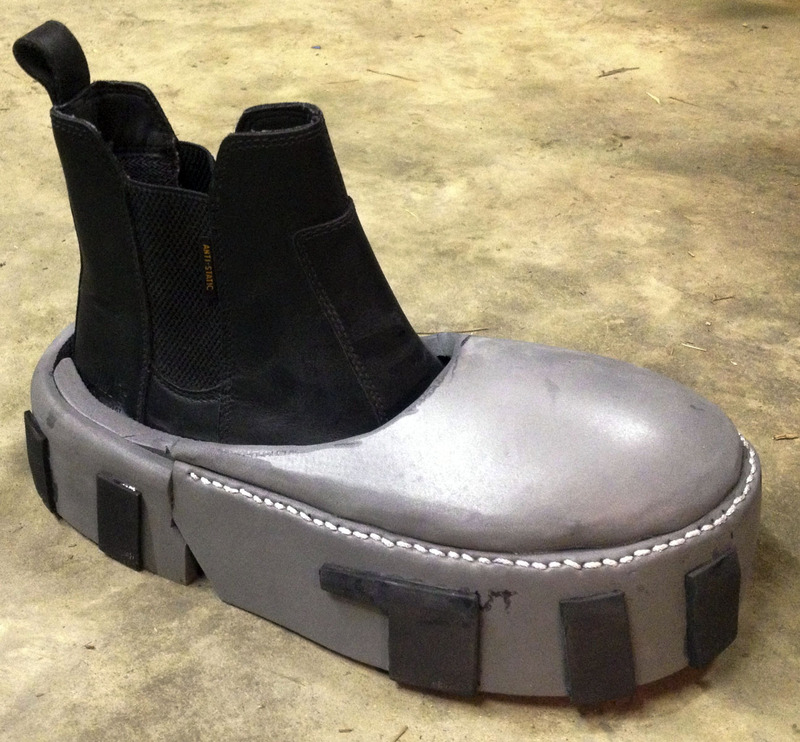 The large pieces are cut & then applied to the boot using superglue. I did not cut the slots into the kneepad inset until after I had glued the piece down. I did a plunge cut with the end of a dremel chainsaw sharpening stone to drill each end of the slot, then went back with the same bit to connect the two holes. I used the same process for the slots cut into the face of the boot top just below the kneepads. 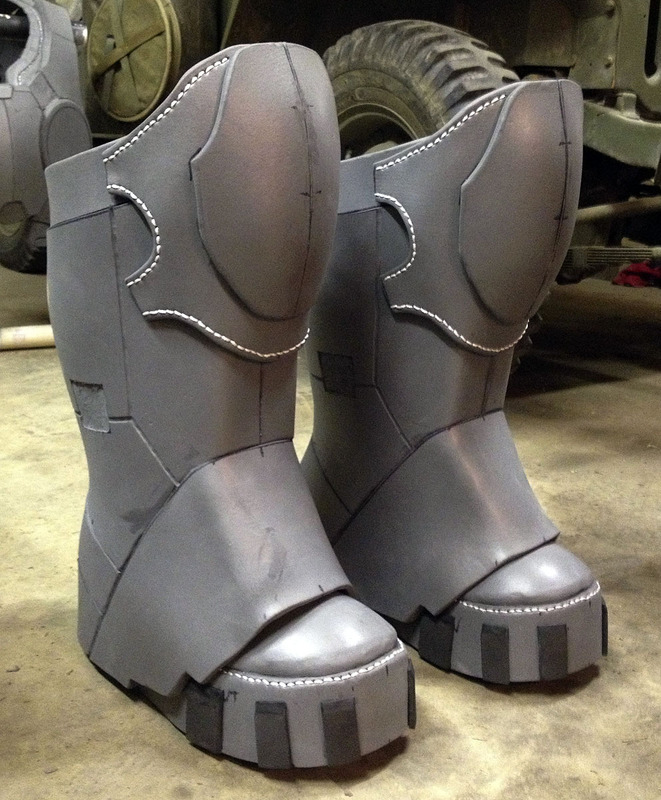 Here's the boots just about done. 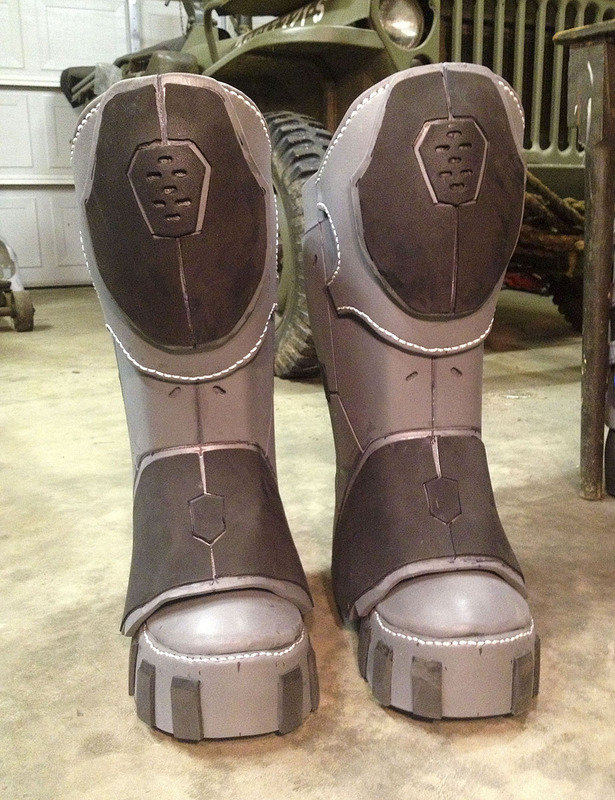 It still need keepers to hide the seam between the kneepad & straps, but it's just about ready for Plastidip. To find out more about simulating the stitching visit THIS PAGE. Upper Right Photo: This is the shoulder paudron pieces after they've been cut out, heated to remove the texture, and the edges dremeled to give them a smooth rounded edge. 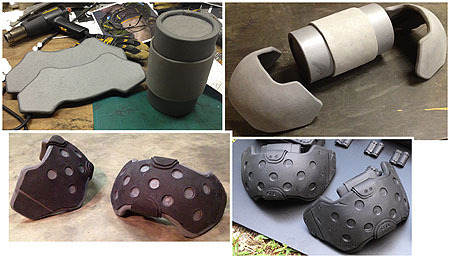 Upper Left Photo: The pauldrons have been heat formed. Robin discovered that an old 2-5/16" hitch ball clamped in the shop vise was a perfect tool for forming rounded sections of foam. You heat the foam up using the heat gun. You'll be heating both the front & back sides of the foam, but really pay attention to the outer side for the stretch/form. Once the foam is heated up enough, you'll pull/stretch the foam down over the hitch ball. Make sure to move the foam around on the hitch ball or you'll get an uneven curve. 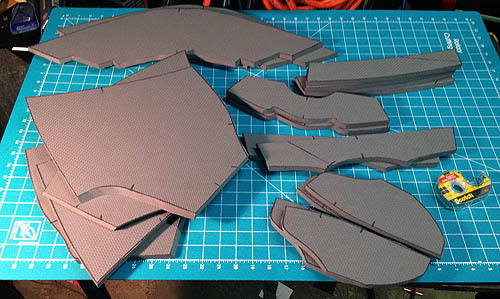 Lower Right Photo: You'll need to remake/adjust the patterns for your fun foam pieces after you've heat formed the main EVA foam. I had to stretch the fun foam template by almost 2" due to the stretching caused by the heat forming. Again, like the slots in the kneepads, I did plunge cuts with the dremel AFTER I applied the fun foam to the pauldrons. Lower Right Photo: These are the pauldrons after Plastidip. They are ready for paint.